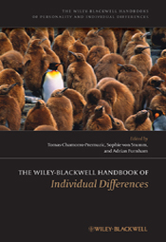 The Wiley-Blackwell Handbook of Individual Differences provides a comprehensive, up-to-date overview of recent research, current perspectives, practical applications, and likely future developments in individual differences. Brings together the work of the top global researchers within the area of individual differences, including Philip L. Ackerman, Ian J. Deary, Ed Diener, Robert Hogan, Deniz S. Ones and Dean Keith Simonton. Covers methodological, theoretical and paradigm changes in the area of individual differences. Covers core areas of individual differences including personality and intelligence, biological causes of individual differences, and creativity and emotional intelligence.